Culms: Erect, hollow, nodes pubescent. Blades: Flat, 2 to 24 inches long, to 1/2 inch wide, rough, often waxy, midrib prominent near base; tips pointed. Sheaths: Open, mostly glabrous; auricles prominent, pointed. Inflorescences: Panicles, dense, plume-like, 6 to 12 inches long, initially open, later contracted, bronze-yellow, fading grayish; tips often nodding; branches grayish-hairy. Spikelets: Paired, shiny, yellowish to chestnut, densely hairy, eventually drooping; sessile spikelets perfect, lanceolate, 1/4 to 1/3 inch long; second spikelets absent, represented by hairy stalks; awns 1/2 to 3/4 inch long, bent and twisted. Habitat: Open prairies, bottomlands, and open woods, more abundant in deep, moist soils, but can also occur on dry slopes. Forage Value: Indian grass is very nutritious and is readily grazed by livestock, but it is only moderately palatable when mature. It decreases when grazed heavily. Birds and small mammals consume the seeds. 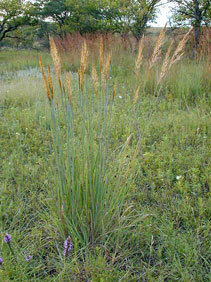 Comments: Indian grass is one of our most important native tall grasses. Prominent "hammer claw" or "rabbit-ear" lobes at the point where the leaf blade attaches to the stem are an identifying feature.